Whether you're packing your own lunch to take to work or preparing midday meals for your kids, a high-protein diet combined with regular exercise is an effective way to lose weight, curb hunger and improve blood-triglyceride levels, writes Henry Harris in "A Passion for Protein: High-Protein, Low-Carbohydrate Recipes for Food Lovers." The key, however, is choosing protein sources that won't compromise other aspects of your health. Tuna fish is an excellent source of protein and lends itself well to sandwiches, salads and as a topping on crackers. Other good choices include cooked salmon, sardines and steamed fillet of sole or halibut. Treat yourself to a small shrimp cocktail, which you can prepare the night before. 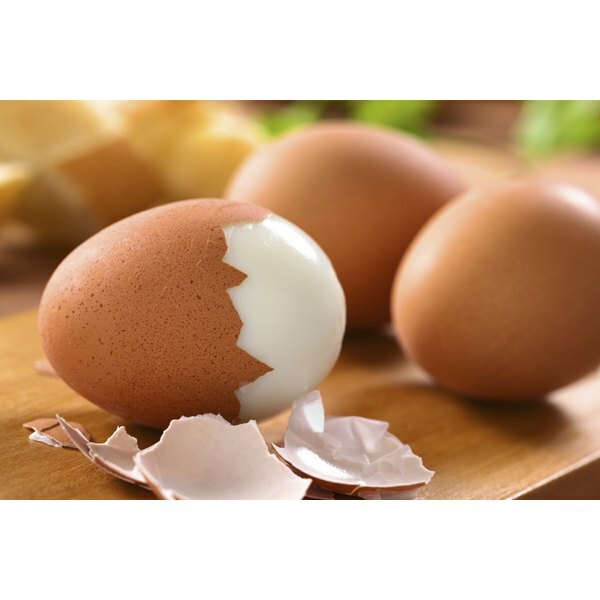 Low-fat cottage cheese, hard-boiled eggs and low-fat yogurt are inexpensive as well as easily portable. For a lunch beverage, opt for low-fat or skim milk instead of soda or coffee. Swiss, Muenster and cheddar cheeses can go in sandwiches, on crackers or just by themselves. Many types of beans are high in protein and lend themselves well to soups, including garbanzos, lentils, navy beans, kidney beans and lima beans. For a midday snack, replace high-calorie candy bars with edamame soybeans. Don't overlook tofu if you have a fondness for Asian cuisine. By itself, tofu is a bland soybean curd that's a healthy high-protein alternative to meat and dairy products and blends to a creamy consistency; it easily absorbs flavors of other ingredients in a favorite salad or casserole. Skinless chicken and turkey slices make for tasty sandwiches, or you add them to a lunchtime entree that includes rice or steamed vegetables. However, be aware that the dark meat of either of these birds carries a higher fat content. Peanut butter has long been a favorite with kids, and it's a protein-rich lunch choice for anyone. Combine it with jelly for a sandwich, spread it on crackers or eat it with celery sticks or apples. Peanuts, cashews and almonds are good for high-protein snacking, too. You also can nibble on pumpkin or sunflower seeds to help get you through the workday. Enjoy nuts in moderation to mind your fat intake, and avoid those that are heavily salted. The High-Protein Cookbook; Linda West Eckhardt, et al. Feminist Women's Health Center: High Protein Diets - Are You Losing More Than Weight?